The 2015 spring meeting was a huge success— we had a lot of first timers and new members show up which is always an excitement for the organization. This was Trevor Newman’s first meeting as president and he also shared a brief tutorial on how to use the MNGA website. Dennis Fulbright was our featured speaker and he gave an excellent talk on his work with chestnuts over the past 30+ years. 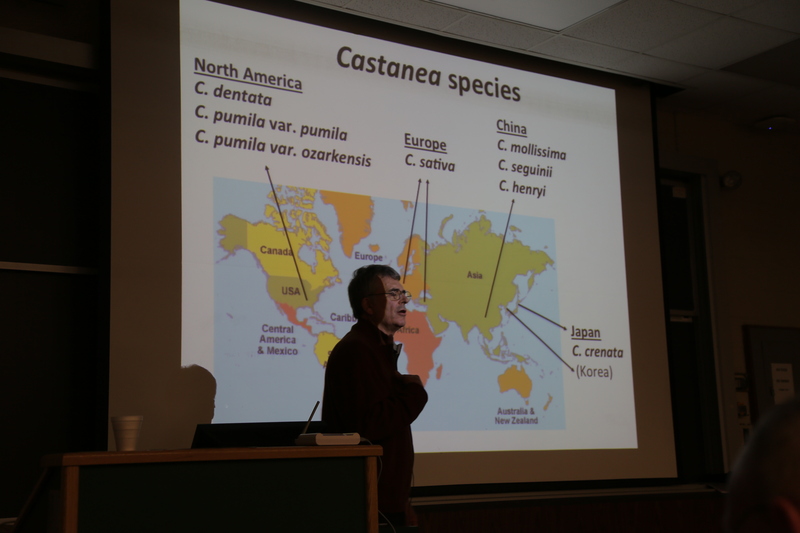 Dennis has been a longtime asset to the MNGA and to the state of Michigan at large with his cutting edge research in chestnut culture and developing ways for combating chestnut blight with the introduction of hypovirulent strains. He has also played a large role in developing chestnuts as a commercial crop in Michigan. Unfortunately the camera battery died but a good amount of the presentation was filmed— CLICK HERE to watch the video segments from Dennis’s presentation. The location for the summer meeting was announced and this year we’ll be meeting at Marc Boone’s farm just outside of Ann Arbor. He has a very interesting site with hundreds of pawpaw trees, a mixed fruit orchard, and a diversity of small fruit plantings of all types. Marc’s collection of currants and gooseberries is impressive, as well as some of the more unusual things he’s growing like aronia, seaberry, and autumn olive. Come on out for a day of fun and learning; go to the Meetings & Events page to find out more. As usual the meeting wrapped up with a scionwood exchange and auction. 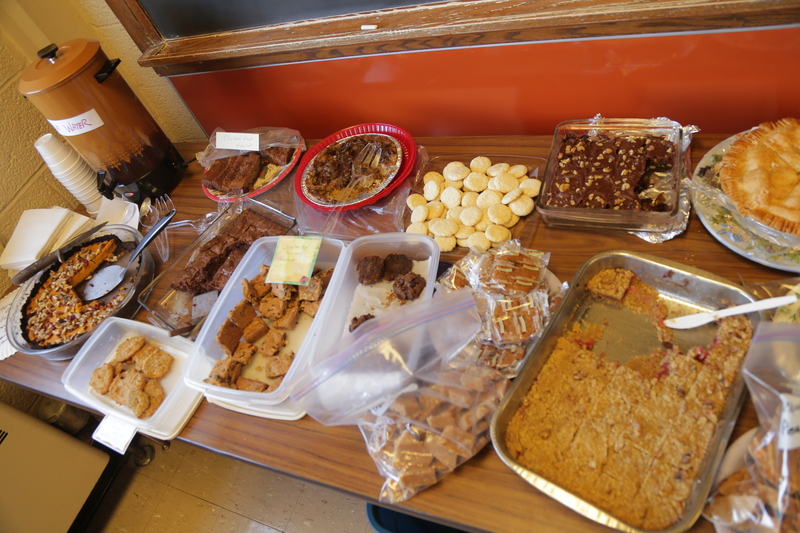 This year we had one of our best auctions in a while and some very interesting nut products like walnut fudge, shelled northern pecans, and more. There were also a number of trees and other miscellaneous items in the auction. Thanks to all who attended and made this a great spring meeting! As always there was a wonderful spread of food featuring all sorts of interesting sweets and baked goods made using walnuts, persimmon, etc. Always a treat for those who come to the MNGA meetings. Dennis Fulbright shares the story of the chestnut and talks about its importance world wide. 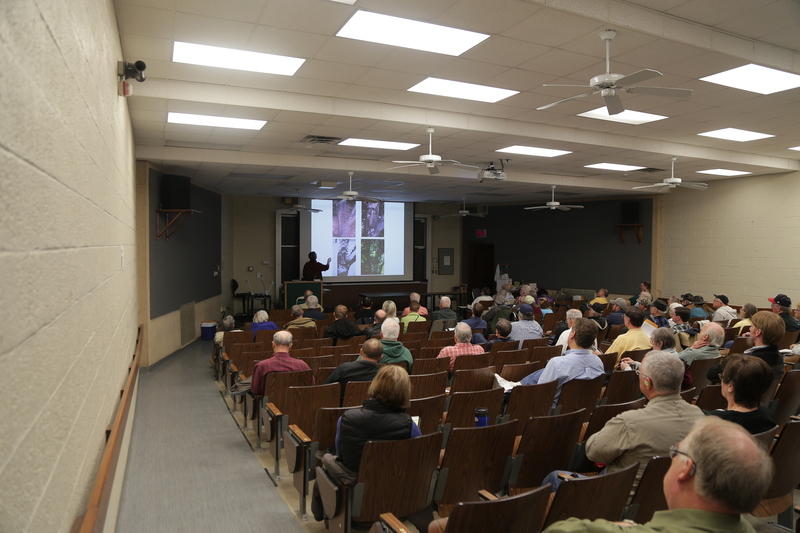 A healthy turnout for Dennis’s talk on chestnuts…safe to assume some people were still busy in the snack room as well!